A rarely seen photograph shows the terrible damage inflicted on one of Van Gogh’s greatest self-portraits. 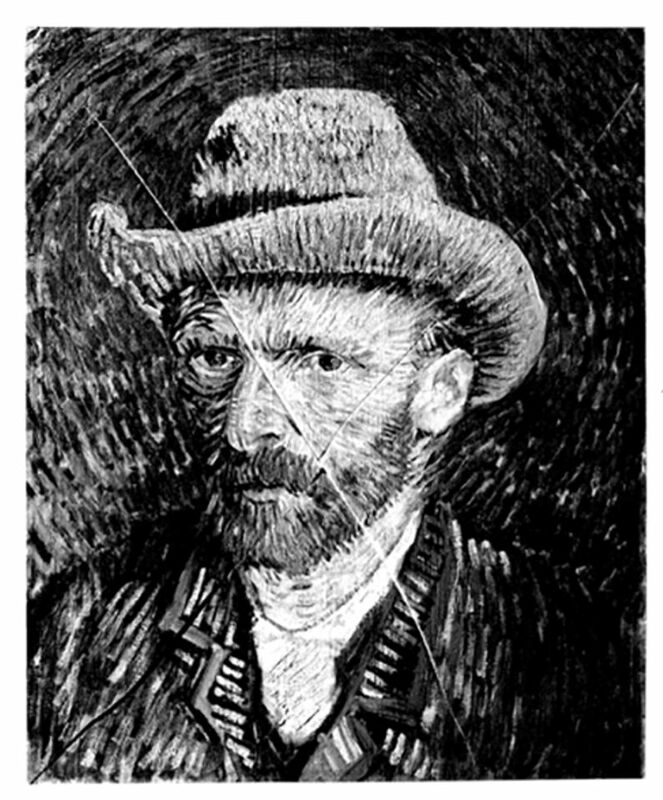 Forty years ago, the Self-portrait with Grey Felt Hat (1887) was attacked at Amsterdam’s Van Gogh Museum by a mentally disturbed visitor. Although a small photograph recording the damage was eventually published by Louis van Tilborgh and Ella Hendriks in the museum’s scholarly catalogue of its Antwerp and Paris paintings (and it had also been in grainy images in a few 1978 newspaper reports), it has not been reproduced elsewhere in the Van Gogh literature. I therefore requested to publish it online for the first time here and am grateful to the museum for supplying the image. Just before closing time on 24 April 1978, a visitor to the Van Gogh Museum took out a sharp pocket knife and slashed two long diagonal cuts across the canvas in the form of a cross, centred on the artist’s cheek. Tiny fragments of paint fell on to the floor. The museum did not at the time have its own restoration department, so the work was undertaken by the Rijksmuseum’s chief conservator, Luitsen Kuiper, with an advisory committee appointed to guide his work. Kuiper favoured replacing the old lining canvas with a new wax-resin support, on the grounds that this would be safest. Committee member Ernst van de Wetering, then an art historian at the government’s central research laboratory and later a distinguished Rembrandt specialist, questioned this, arguing that the wax-resin relining could lead to further discolouring of the ground layer. Van de Wetering’s advice was considered, but the committee backed Kuiper and the ground layer did not in the end suffer. The self-portrait went back on show by the end of 1978. The extensive cut marks are effectively disguised when the picture is viewed straight ahead, although they are now visible when carefully examined from the sides (partly because Van Gogh’s original paint and the restored areas have faded slightly differently). The vandal, identified in court by his initials MR, was a 33-year-old self-proclaimed artist from Amsterdam. In September 1978 a judge deemed him not to be sane and sent him to a mental institution for treatment. 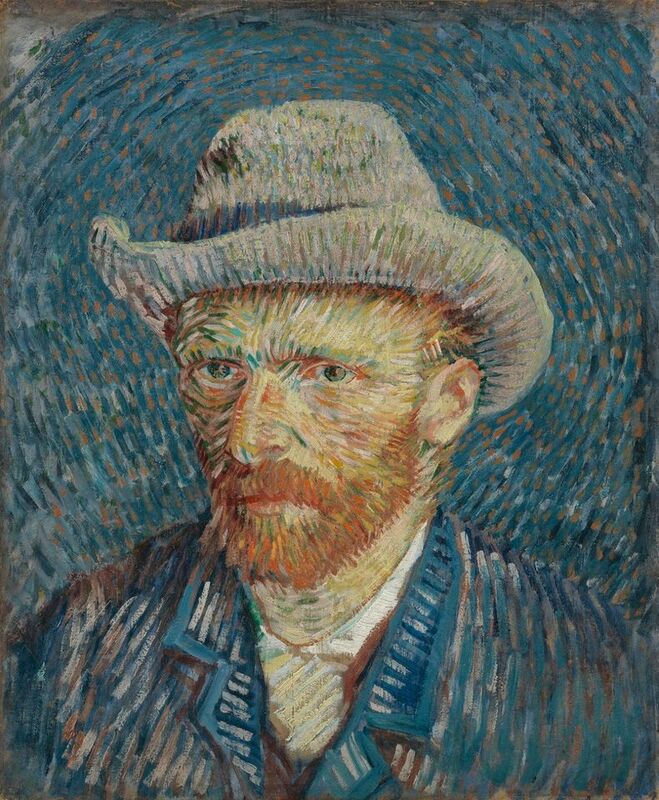 The vandalism of Self-portrait with Grey Felt Hat came less than three weeks after another man vandalised Van Gogh’s portrait of Augustine Roulin (1889) at Amsterdam’s Stedelijk Museum. The Stedelijk incident was just two days after a knife attack on Nicolas Poussin’s Adoration of the Golden Calf (1633-4) at London’s National Gallery.